It's a piece of cake!! I think my Nestabilities have been the best investment I've made! They are so easy to use and are incredibly versatile! Last night I was browsing my favorite blogs and decided to give Lauren Meader's Nestability basket a try. What a cute idea, Lauren. TFS. Anyway, while assembling my basket, I was inspired to make a piece of cake. After I completed my basket, I threw together a quick prototype to see if my idea would work. Tonight I put it together for real and this is what I ended up with. I used the large scalloped rectangle Nestabilites, cutting and embossing 3 to make the cake. I'll post more detailed instructions later in the week. 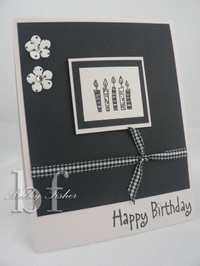 I used some of my Basic Grey paper, ribbon and a Hero's Arts stamp set called Birthday Messages. The back of the cake is cut out of a piece of brown Basic Grey paper that came in the package. It kind of gives it a chocolate frosting feel, and I used pink for the sides. I filled my piece of cake with strawberry milkshake flavored Whoppers and chocolate Whoppers . . . a few managed to make it into my mouth! YUM! When I was a kid, every Easter the Easter Bunny would leave the best Easter baskets at my house! Without fail he would leave my favorite goodie . . . Peeps! I was so happy when Peeps became more than just bunnies and chicks. I have seen Valentine's, Halloween, and Christmas Peeps. Yes, I treated myself to a yummy box of heart Peeps this past Valentine's day! Anyway, here is a treat box that has been around for awhile but is one of my favorites. I have seen them on SCS but made one at an SU workshop a few years back. The box itself is 4" x 8", scored in the middle at 4". The sides are scored from the middle of each end down to the middle score line on either side of the box. If you can't find the pattern on SCS or not sure following my written instructions, email me or post and I'll post illustrated instructions. I found the bunny stamp set in the dollar bin at Michael's about a month ago and it reminded of bunny peeps. 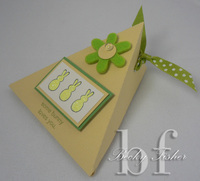 The sentiment is from a retired TAC set called Somebunny. The felt flower is from Hobby Lobby. They come in single color packages of green, blue, pink and purple in the Easter section. There are quite a few in the bag for $1.99 . . . I just counted and there's 24 in the bag. They have little gemstones in the centers so I just plucked it off and put my own embellishment. By the way, the bunny stamp is a 5 bunnies long instead of 3. I cut two bunnies off. Sorry. I'm re-posting because I forgot about coloring the bunnies. After I stamped the bunnies, I colored them in with my Souffle gel pens and then while the ink was still wet, sprinkled them with crystal ultra fine glitter. And another birthday card . . . Since I'm in dire need of birthday cards, I've been on a roll. I am ALWAYS needing a last minute birthday card but never have any on hand. I hope to be on the ball better this year. So far so good. 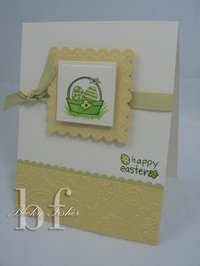 This card was made using another background stamp from Cornish Heritage Farms. It's the polka dot background stamp. The cake and sentiment are from Hero Arts in a set called Birthday Messages. 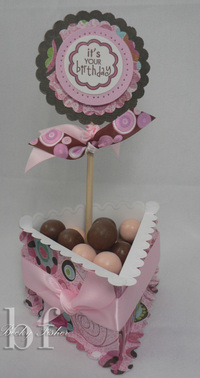 I stamped the polka dot background in white VersaMagic on pink bazzill. I used my scallop punch and then two smaller circle punches. I colored the cake with my Copic markers. I hole punched the lower right hand corner and stamped the sentiment in the window right onto my white card. I then took packaging tape, taped it on the backside of my pink c/s so that the sticky side of the tape showed through the punched window. I sprinkled the exposed tape with ultra fine crystal glitter, tied a ribbon onto the pink c/s and adhered it to the front of my white card. I've had several people ask me to share the recipe for the Bugles. I used white chocolate bark, melted it in the microwave and dipped the ends of the Bugles in it. I then dipped them in colored sugar before putting them on a piece of wax paper to harden. They harden in about an hour or two. I made these at Christmas but because I waited too long to make them, I couldn't find the bark squares at my grocery store. I ended up using Ghirardelli while chocolate bars from the baking section which was really good but it took over night to harden. These are really fun to make because you can decorate them with different sugars and candies to fit the holiday. Also, I had someone ask what stamp sets I used on the white sack. It's actually a pre-printed sack that came in a packge of 9, I think. The package contained 3 printed, 3 solid reds and 3 solid whites. Okay, now to the yummy stuff. Here are a few more goodies I made last weekend while I was in San Antonio. The bag of Bugles is just a long clear envelope sealed and tied off at the top. The tag is made with one of the new Valentine sets from TAC called Forever. I used my Nestabilities to make the tag and matted it with red bazzill cardstock. I tied red polka dot grosgrain ribbon around the top of the bag. The treats inside are just Bugle chips dipped in white chocolate and then sugar sprinkles. It's the perfect combination of sweet and salty. Yum! 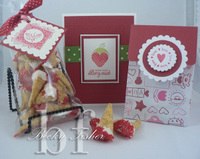 The strawberry card was made with the My Punny Valentine set from Papertrey Ink. I used Versamagic in on vanilla bazzill and I used my Scor-Pal to make the lattes background. The bag is just a little sack from Target that came in a package. I created a flap using red bazzill and my Nestabilities. The stamp set if from Hero Arts and is an exclusive set for Archiver's. This is Sam. If you are lucky enough to be owned by a feline, I'm sure this is all too familiar. I share my stamp room with two tuxedo kitties, both of which are rescues. 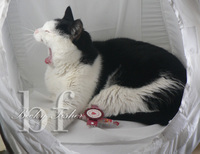 Rarely would I ever catch Oreo in a picture like this one. Sam on the other hand . . . well, he definitely runs our house. I found him on the side of a busy highway about to cross 5 lanes of traffic almost 9 years ago. He was maybe all of 8 weeks old when I found him. He was filthy and covered in fleas. As soon as I got into the car with him, he was on his back and was purring. He's never been a shy man. To this very day, he greets all our guests at the front door, makes himself comfy on the arm of the sofa as they sit down and then eventually tries to easy himself into their lap. If you bring a purse in with you . . . well, he's either going to pilfer through it or snuggle down in it. Rarely are we able to leave him out with company because he is such a pest. We keep a can of Reddi Whip Cream in the fridge just for him. He usually mooches about 3 squirts of it every day from either me or my husband. This is a habit my husband started when he was a kitten. So this is Sam and we love him very much! Just had to share.